For most of us, Easter is not Easter if you don’t decorate eggs. This year, instead of letting the kids have all the fun, start a tradition that involves the whole family. 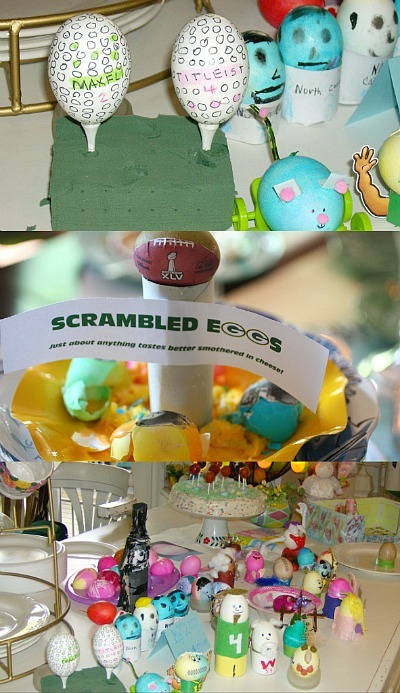 Throw an annual Easter egg decorating contest. Choose plenty of categories so everyone gets a chance to win. Some great categories might be: funniest egg, most original egg, best look alike egg and the prettiest egg. The wackier the categories, the more fun you’ll have decorating and judging. I think our family ended up with about ten categories, and they were too funny. I have hosted this with our extended family tradition for many years. We have had such a blast, and I even had our out of town family send their entries via email. I just got an email from my newly married niece, who lives ten hours away. Her email subject title said, “Top secret egg pictures.” She wanted to make sure no one got a sneak peek at her creations, since she knows how sneaky our family can be – namely her own dad. I’ll try and scan the pics of our eggs from last year (yes, I was still in love with print pictures in 2008). We had over 30 eggs and they were HILARIOUS! Your home always sounds like so much fun. I should have had more children….. Two is not enough. As always, you are an inspiration and a great mom. P.S. And always sooo positive!!!! We are having an egg decorating party with friends on Thursday – this will be the perfect thing. This sounds like SUPER fun! We’ll definately have to try this out, this year. Thanks so much for sharing! How much fun is that? I would love to do something like that with my extended family of 30+. I don’t think I could get everyone to participate, though. Any suggestions? Or would bribery pretty much cover it? That sounds like so much fun, Jen! We are usually so busy around Easter (as we are this year, too!) we don’t usually decorate eggs, but if we ever do, this is definitely an idea we’ll do! What is your Worship Team doing for Easter? Ours has a couple of Israel Houghton songs lined up as well as “The Old Rugged Cross” redone. We have three services planned…I’m getting tired as I’m thinking about it! : )Sound Man and I are going to absolutely crash Easter afternoon!